Controlled Unclassified Information (CUI): What is it and Where does it come from? Companies supporting the defense industry are scrambling to understand how to classify and protect information. Does this apply to your company? This blog will help you answer the following four common questions about unclassified government data in a commercial IT infrastructure. Why am I required to protect CUI/CDI/CTI as a defense contractor? Do I have CUI/CDI/CTI data in my IT System? How do I protect CUI/CDI/CTI data? Understanding these definitions will help you develop a baseline of knowledge to develop a plan and properly protect unclassified government data in your information systems. What is CUI, CDI and CTI Data? Controlled Unclassified Information (CUI) and Covered Defense Information (CDI) are relatively new markings, but similar markings have a long history within the government. CDI is an umbrella term that encompasses all CUI and Controlled Technical Information (CTI). These three markings are given to unclassified content that must be protected in a very specific manner both within and outside a government information system. In the past, the government used many different markings to identify this kind of information. You may have seen or used some of these in the past: Unclassified Controlled Technical Information (UCTI), Sensitive but Unclassified (SBU), For Official Use Only (FOUO), Law Enforcement Sensitive (LES), etc. These are now all rolled up into the classification of CDI content. Clear as mud…. Right? No one said this was easy…. CDI as a category encompasses both CTI and CUI. CTI is defined as technical information with a military or space application that is marked with a distribution statement in accordance with DoDI 530.24 (Distribution Statements on Technical Documents). In general, the controlling Department of Defense (DoD) office is responsible for determining if information is CTI and properly marking it prior to contractor access to the information. However, if a contractor develops unclassified CTI in the performance of a contract, the contractor must work with the contracting officer to ensure that the appropriate forms are completed, statements of work are in place and distribution statements are assigned to each piece of content. This content must be protected at the same level as other CDI and CUI content; it just has special marking and tracking requirements. The CUI Program was originally developed for all Executive Branch Agencies. Believe it or not, this program is significantly simplified. 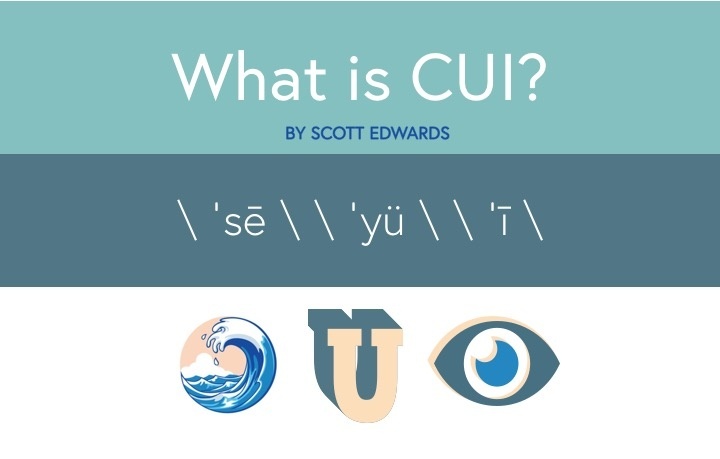 Prior to the current CUI program every agency used a different set of markings, information classifications, and rules for how to manage and control the information. In general, CUI is information marked or identified in a government contract or provided to a government contractor by the DoD in connection with a contract; however, it can also be content that is developed by the contractor during the performance of a contract. This content is marked or identified by the DoD as requiring safeguarding or specific dissemination controls. I recommend that you review and learn the new CUI marking program to ensure data is properlyidentified. Get started by checking out the government marking guidance. There are hundreds of different sets of regulations, laws, and U.S. Code that specifies how each of the CUI Specified information types must be controlled. The best way to determine what the requirements are for any specific type is to go to the CUI Registry and search for the content you are interested in. The full list of CUI categories can be found in the CUI Registry. There are 24 Categories of content and 83 sub categories of content! Each category is defined as either CUI Basic or CUI Specified. CUI Basic contains the baseline handling and dissemination controls as identified in the Final Rule issued by NARA (the National Archives and Records Administration) on November 14, 2016. The Federal Information Systems Modernization Act (FISMA) requires that CUI Basic be protected at the FISMA Moderate level and can be marked as either CUI or Controlled. CUI Specified is a subset of CUI where the authorizing law, policy, or regulation puts more restrictive controls on the handling and control of the CUI Specified content. The underlying authority maintains the handling controls on CUI Specified content and ONLY a designating agency may apply the limited dissemination controls to CUI content. This cannot be done by an agency that was not the original designating authority. More importantly, agencies cannot increase CUI Basic’s impact level above moderate external to their agency without an agreement with the external agency or contractor organization operating an information system on their behalf. What you really need to know is that CUI agreements can take the shape of a contract, grant, license, memoranda of agreement, or information-sharing agreement. Understand the data categories on your contract, what data you may create during the performance of a contract, the requirements to protect that data, and the costs associated with that protection before you sign the contact. One of the questions that I regularly receive is “Why are we being required to protect this CUI and CDI content?”. In short, bad actors (hostile states, individuals, and corporations) are trying to get it and if they succeed it could hurt individuals, organizations, or our national security. We see it in the news weekly and if you dig a little, daily. Espionage (both Corporate and State) is at an all-time high. New hacking revelations occur frequently in news media when corporations lose important privacy information due to data mismanagement. CUI and CTI data doesn’t exist only within government data centers on government systems. It exists across the entire defense industrial base spread across thousands of companies with widely varied IT infrastructures. Many of those infrastructures are simply not up to the task of properly managing and taking care of the CUI/CDI/CTI information that they were entrusted with by the government. Government investigations identified the lack of security as a primary contributor of security breaches; therefore, the CUI / DFARS 7012 programs were established to begin standardizing the security controls across the defense industrial base to better protect our important information in both government and commercial environments. What you really need to know, is that failure to protect CUI/CDI/CTI data can result in a rapid loss of a contract. Ensure that you have properly identified and classified the data before you propose a contract to ensure that you have provided adequate margin in your contract or overhead calculations to implement controls in your information systems. This is really the crux of the issue, isn’t it? Do you, as a government contractor, have CUI/CDI data that must be protected? Sure, the government has put the DFARS 7012 clause in your contract, but do you have CUI/CDI content in your environment? Unfortunately, in most every case, the answer is an emphatic YES. Here are common examples of data you must protect under DFARS as a defense contractor. Support of Administrative or Human Resources functions with Personally Identifiable Information (PII). Technical information including research and engineering data, engineering drawings, associated lists, specifications, standards, process sheets, manuals, technical reports, technical orders, catalog-item identifications, data sets, studies and analysis, and related information and computer software executable code and source code. There is an incredibly wide range of content that unclassified but falls within the controlled data definitions. In our work across the Defense Industrial Base, we have yet to encounter a company that did not have CUI/CDI/CTI data in their infrastructure if they were working with the DoD and had the DFARS 7012 clause in one of their contracts. What you really need to know is that technical work that is executed for the government, which results ininformation or data being created or transmitted, is potentially covered by the CTI designation. Ensure that you have properly identified and classified the data in your information system to provide adequate security controls. The government provided lane markers as part of the DFARS 7012 rule that stipulates exactly what type of controls must be in place to protect CUI/CDI content in your information system. You have three options. A Hybrid Solution that uses both on-premises systems and CSP solutions to meet NIST 800-171. With any of these three solutions, you must also ensure that the solution addresses the 110 Security controls in NIST SP 800-171 along with a Systems Security Plan (SSP) and a Program of Actions and Milestones (POAM). Corporations that traditionally serve the defense industrial base have historically managed data in localized data centers and facilities. There was a sense that data centers located behind the physical security of the business provided adequate data security. The physical presence of the servers in the facility may have provide a false sense of, “I know where my data is.” The reality of the cyber environment today requires multiple layers of physical and cyber security with frequent administrative responsibilities to maintain patches and firewalls. Many large enterprises have sufficient staff and training to maintain on-premises networks to serve their government contracts and controlled data; however, the capital expenditure of replacing hardware and the operational expenditure of the maintenance costs should be reviewed with each round of data center updates. Alternatively, CSPs are a great option for businesses of all sizes, because it helps the organization offload large portions of physical security, administrative management, and risk to the CSP. CUI/CDI/CTI compliance in a CSP may be a more affordable option since there is no requirement for a large data center capital investment for servers and physical security. Be aware that businesses using a CSP still have a responsibility to ensure that the environment is certified at a FedRAMP Moderate level, AND that you are protecting the environment with the 110 Security controls in NIST SP 800-171. For more details refer to the NIST SP 800-171 blog post. What you really need to know is that a critical decision to proceed with on-premises data center or a CSP should be a part of a corporate overhead strategy when proposing on defense contracts as a prime or subcontractor that include the DFARS 7012 clause with NIST SP 800-171. Ensure corporate decision makers understand both the short-term capital investments and long-term hidden costs of your proposed data security strategy. I have CUI/CDI/CTI data in my IT Data Center. Now What? Stay tuned in for more information. My next blog will cover the pros and cons of NIST 800-171 implementation for on-premises systems as well as Cloud Solution Provider (CSP) solutions such as Microsoft Office 365, Microsoft Azure, Amazon Web Services, and Google GSuite. Interested in learning more about security and compliance? Scott Edwards is an accomplished computer engineer and organizational leader with experience in business, project management, systems engineering, training and security. Scott’s technical experience was honed at NASA as a Senior Computer Engineer and the Chief Engineer and Engineering Manager for the NASA Datacenter. Scott received his Bachelor of Science from the United States Military Academy and his Master of Science in Computer Science with an emphasis in Information Assurance at James Madison University. Scott proudly served as an Officer in the US Army Signal Corps with both the 2-227th Aviation Battalion in Bosnia-Herzegovina and the 1-6 Air Defense Artillery Battalion in Fort Bliss, Texas. Currently, Scott is the President and Managing Partner of Summit 7 Systems. Summit 7 Systems is Service Disabled Veteran Owned Small Business (SDVOSB) and a Microsoft Gold Cloud Productivity Partner that specializes in Office 365 security solutions.